Designed to store your dining treasures, this cabinet will comfortably hold a dinner service, glassware, linen and cutlery; the essential elements for a fabulous dinner party. 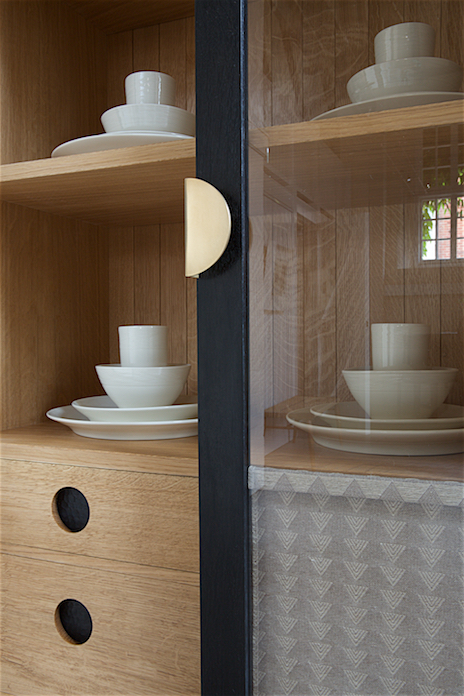 An accommodating oak cabinet, with solid 4,000 year old bog oak glazed doors, made in collaboration with weaver Emily Mackey and potter Chris Keenan. With detailing inspired from Italian trattoria furniture of the 30’s; Emily’s hand-woven geometric linen divides the cabinet hiding three dovetailed drawers and a lower storage unit. Chris made a six piece porcelain dinner service specifically for the cabinet, this consists of a dinner plate, side plate, bowl and beaker in a beautiful off-white glaze. Custom brass demi-lune handles meet seamlessly to create a inviting circle of brass, the circular detail continues with the recessed drawer pulls made in chip carved bog oak.